How to Recover Deleted Video/Movies from iPhone on Mac & Windows? Compare to other ordinary phones, Apple's iPhone has different versions: iPhone 32G, iPhone 64G and iPhone 128G. With the large storage capacity, you can record videos, download movies/music, take photos or get unlimited apps from iTunes store without worrying about the space. Therefore, we suspect that you have stored one or two favorite movies and lots of funny video clips on your iPhone, but one day you found that these precious videos is lost due to unknown reason, then what will you do? To iPhone users, losing data is not a rare experience. Deleting videos you treasures very much can be a more disappointing thing for you. But we can do something to find back the lost or deleted video after it happens. Technically speaking, each time you sync your iPhone with iTunes, there'll automatically generate a backup file called .sqlitedb. So once you've found your precious movies or video is deleted, don't worry, you can restore them with a smart iPhone Video Recovery software. Believe us, if you've taken the recovery soon, you can recover deleted movies from iPhone completely. 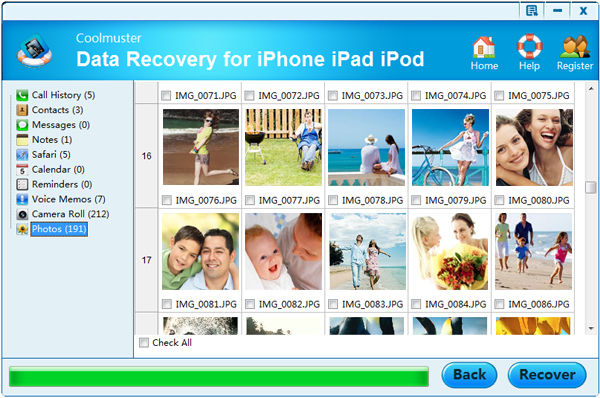 Now, just download the iPhone Video Recovery application free trial version: Coolmuster Data Recovery for iPhone iPad iPod (Windows Version) and Coolmuster Data Recovery for iPhone iPad iPod (Mac Version). How to Recover Deleted Notes from iPod? Tips: To make you understand how the program works, here we'll take the Windows version as an example. You can follow the below steps to restore lost video from iPhone as you like. What's more, if you're a Mac user, you can follow the same steps and perform the iPhone Video Recovery for Mac on your own MacBook Pro/Air as you like. When running the program on your computer, it will automatically detect all iTunes backup files on your PC and display them one by one on the interface. 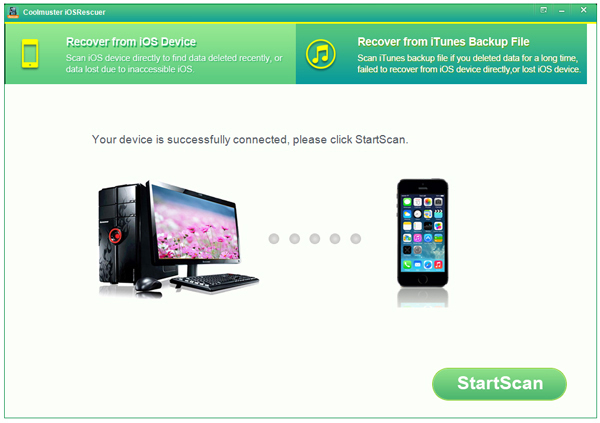 Just select the one of your iPhone, and then hit "Start Scan" to begin to scan for files. When the scan is over, all backup files will be displayed into different folders. To recover iPhone deleted video, just click "Camera Roll" in the left panel, and then you'll see the detailed pictures or videos in the right panel. Go through and find all videos you want to recover, just select them one by one. If you're sure that you've selected all videos you want, then you can click "Recover" button to save them on your computer without any quality losing. Note: If you have a need, you can click "Check All" to recover all of them with this software. To avoid losing videos again, just backup them in other places. And you can regularly backup your iPhone data to computer with the best iPhone to Computer Transfer. What if You Lose Videos from iPhone without iTunes Backup? The above tutorial is based on the presumption that you have an iTunes backup of the lost files. So what if you lose these important files from iPhone without having an iTunes backup? Then you need to try this Coolmuster iOS Data Rescuer software, which allows you to easily recover the lost files from iPhone no matter you have an iTunes backup or not. Different files can be perfectly supported with this software, including contacts, messages, videos, apps and many more. Most importantly, all generations of iPhone, iPad and iPod can be all be compatible! > Open the installed software on the computer and then get your iPhone connected to the computer via the USB cord. > Then choose the mode of Recover from iOS Device Itself to continue the process. > Now, all the files are displayed on the left panel for your reference. > Enter the Videos tab to preview more detailed file information and then tick out the files you want to recover from iPhone. And finally hit the Recover option to recover these files in one click. Since various unexpected reasons can possibly lead to unwanted data losses, you are warmly suggested to make a phone backup of your iPhone device. And you are free to choose backup iPhone to iCloud, iTunes, computer or even backup iPhone data to external hard drive as you wanted! How to Recover iTunes Forgotten Passwords? iTunes Won't Sync with iPhone, How to Fix It?